Steve: Good morning! Everyone! This morning we have the pleasure of having with us Dr. Herbert B. Newton a Neurology specialist. He will be speaking about Bevacizumab, i.e., Avastin™. He is from the Kettering Medical Center in Dayton, Ohio. He does joint work with Florida Hospital, Orlando campus, at the Cancer Institute. He will be speaking more about that this morning. Let's give a big NF2 round of applause! Dr. Newton: Thank you very much. It's a pleasure to be here. I was here a few years back and enjoyed it. It's nice to be part of this group again. I am going to talk about Avastin™ and give you guys basic background on it and tell you some of the recent data that's come out in the last five (5) years related to using it for NF2 and Schwannomas and those types of tumors. Newton.p3. So we will go through a bit of a biology and angiogenesis of Vascular Endothelial Growth Gactor (VEGF). That is the protein that is involved in growing the blood vessels in brain tumors, including Schwannomas. It's got a VEGF receptor. We will take time to learn about Bevacizumab itself, what the drug is like and how it works. 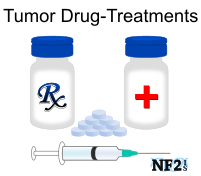 We will go through a bit of the data using this drug in NF2 and trying to treat these tumors. Two people in the room here I have treated with this drug at the James Cancer Hospital and Ohio State University (OSU). I will give you information about how the drug worked for these two folks. Newton.p4. So to start off, we will talk a bit about brain tumor Angiogenesis, or the development of blood vessels in tumors. Studies have been done to show that the blood vessels in the tumors correlate with the levels of VEGF, another angiogenic factor. In high-grade Gliomas, the amount of blood vessels overall is highest in the more aggressive tumors. These tumors secrete a lot of these angiogenic factors. They secrete VEGF, and you see a long list of other factors. A lot of these are being secreted all the time by these tumors, trying to grow their own blood vessel supply. These angiogenic factors are diffusible molecules. They drift away from the tumor towards the blood vessels easily trying to grow more vessels for the tumor. They bind to receptors on the capillaries nearby and try to make the capillaries grow toward the tumor and give the tumor more of a blood supply. There are also other things that the tumors are secreting like matrix degradation enzymes and a lot of other stuff. Newton.p5. But for our conversation, the main thing we are worried about is the angiogenesis excitatory factors. So all cells secrete these factors. It's normal for a cell to secrete an angiogenesis factor. But normal cells secrete equal amounts of positive inhibitory factor so there is an even balance in the tissue. With tumor cells, they are secreting a lot of angiogenesis stimulatory factors, but almost no inhibitors. This is through Oncogenes, loss of Tumor Suppressor Genes, so you get an angiogenic phenotype in the tumor area where it's constantly trying to stimulate blood vessel growth. A tumor does that so it can grow faster and be more aggressive in the normal tissue around the tumor. What we find when you have a tumor in its early phase, it hasn't grown its own blood vessels yet. It can't grow very aggressively. It ends up getting its oxygen and other nutrients through diffusion of stuff spreading through the tissues from the nearby blood vessels and supports one (1) to two (2) million cells. A very small amount of tumor tissue can be supported that way. It has to grow its own blood vessels to be able to grow quicker and grow a larger tumor. That's how they get their ability to grow quickly when they get their own blood supply. Newton.p6. These vessels are not normal. They are leaky. They are what causes edema (swelling) in the brain. So the tumor secretes growth factors and other things that stimulate these nearby endothelial cells to proliferate. And they have a lot of receptors nearby on the endothelial cells that respond to those factors like the VEGF receptor, and those end up stimulating the blood vessel growth. They are also secreting other types of things like enzymes which actually degrade the area around the tumor to allow the blood vessels to grow more easily into tumors. I have pictures to show what that looks like. Newton.p7. In this picture, these are the endothelial cells. There is the tumor mass secreting all these factors. Here is the one we are interested in, VEGF. They come here and start stimulating receptors along the nearby blood vessels, to the point where this little capillary tumor starts. And then with more stimulation, that capillary tube keeps getting bigger and growing towards the tumor nodule. And eventually, it ends up going into the tumor nodule and feeding it directly. This is a setting where now this tumor that has Neovascularized and grown its own dedicated blood vessel, and that's what feeds it, to allow it to grow more aggressively and faster. Newton.p8. Now in this setting with its own blood vessel, it can grow a lot larger, and it's easier for it to become a more serious symptom-producing tumor. So these are a couple of early intense slides. I won't go through the details because it will put you all to sleep. But VEGF is a family of proteins, A through F. The VEGFA gene, that's the gene that's mainly involved with blood vessels for brain tumors. There are a lot of things that regulate this gene, including Hypoxia, or low-level oxygen. Also receptors, all kinds of things that excite this and secrete VEGF. The most powerful one is low-level oxygen in the area around the tumor. Newton.p9. In the area around the tumor, the lower the oxygen level, the more the gene is excited and produces VEGF. There are also a lot of other positive regulators, including growth factors like we mentioned before, internal signal transduction pathways and also a lot of inflammatory enzymes. All these things can turn this gene on to secrete VEGF and grow more blood vessels. There is also VEGF dedicated vessels around the tumor. VEGF receptor 1, 2, and 3. Two is the main one that we see on the blood vessels in Gliomas and Schwannomas. Newton.p10. They all have a similar structure. They have 7TK domains (Tyrosine Kinase). After binding, two of the receptors dimerize and form a complex. Once that happens, the kinase remains inside the cell and gets excited and turns on the signal transduction machinery inside the cell. I have a picture of that for you in a second. So this is a picture of these receptors, VEGFR1, 2, and 3. The second domain here is where the actual receptor activity is taking place, where VEGF binds to it a receptor and gets stimulated. Down here at the bottom is the tyrosine kinase area that's activated inside the cell. And this is the pathway inside the cell when it gets excited. There is the VEGF right there, receptor, and activates RAF and goes through different pathways. All these things lead to angiogenesis and lead to stimulation of these endothelial cells and the blood vessels near the brain tumor. Newton.p11. So then we switch gears and change over to the drug itself, bevacizumab, or Avastin™. This is a recombinant humanized monoclonal IgG1 antibody. It's targeting VEGF specifically and its ability to bind to the receptor on the endothelial cells. Half-life is about 20 days, so we give it on every two-week or three-week schedule. It's IV. Again, it works by binding to the VEGF. So VEGF isn't allowed to bind to its receptor, thereby stimulating the endothelial cells. It takes all the angiogenesis stuff and slows it down, kind of makes it inhibited. This is a picture of the antibody itself. This is the Bevacizumab antibody. Again, it's humanized. Newton.p12. About ninty-three percent (93%) of this is human. And the pink parts are actually the MURINE parts, that comes from the mouse. That gives you the specificity for this molecule to target VEGF. They do it this way to minimize your own body's immuno-responses to the drug. If there was too much mouse protein in there, you would develop an antibody response to this antibody, and it wouldn't work. So this is what's happening in the pathway. You are taking the Bevacizumab, binding VEGF, not giving it a chance to stimulate the VEGFR2 receptor very much. Then all this internal transduction machinery gets shut down. So that way you are stopping the stimulation to grow new blood vessels. It's a very powerful effect. I will show you some pictures of that in a minute. Newton.p13. So this was studied initially in Melanoma and Lung Cancer and Colorectal Cancer. The data came out that it was a powerful drug. It had strong anti-angiogenesis effects. People started studying it in glioma brain tumors first. There was initial data in 2005 that suggested it helped in Glioblastomas and high-grade Gliomas. Then Duke did a larger study where they had some very good responses, over fifty percent (50%) response rate by MRI showing the tumors were shrinking and had decreased enhancement from this drug with longer survivals. Newton.p14. So then they ended up doing an update study in almost seventy (70) patients. Over half of those were GBM. Again, they had the same thing, good response rate, MRI showing tumor reduction and enhancement. Shrinkage of tumor size and people living longer than before. So then they ended up doing a trial through the FDA called the brain trial, to kind of prove once and for all that this was legitimate and this was worth FDA approval. So they ended up doing this study in glioblastoma patients, and half of them had Bevacizumab by itself. We participated in this study at Ohio State, and the bottom line is that it ended up having twenty-four percent (24%) objective response rate in glioblastoma which is more than double than had ever been shown before in this controlled study. Newton.p15. This led to FDA approval of using this drug in Grade 4 Gliomas. Once that happened, then we started to look at the drug in other tumor types. Newton.p16. This is a patient I took care of who was not part of this study. This was a large area of progressive tumor that he had. And he had failed a bunch of other different types of chemotherapy. He failed his radiation therapy. So we started him on Avastin™ at this point. Within six (6) months, this is what happened. It was gone. So we had a complete response in this guy. Newton.p17. This guy was actually a lawyer who had been working with me on cases of patients with Glioblastoma. So it's incredible that he ended up getting the same type of tumor of patients he was defending in lawsuits that he was involved with. He ended up doing fantastic on this. He was treated for about close to a year, maybe 15 months. Then he was so tired from treatment that he wanted to stop. We told him to keep going. He said, no, Doc, I am trying to defend my patients. I am going to the Courts, and I am so tired, I can't function. I want you to take me off the drug. I took him off the drug. Within six months, they came back and we never got it under control again and we lost him. Which is a horrible shame. But at least it proves a point in how powerful this drug can be in certain tumor types. Newton.p18. So then we get to the listing of tumor types in adults. That guy had a GBH, which is the most common tumor type. Schwannomas are further down on the list. They are not as common in the listing of tumor types for adults, about sevel percent (7%) to eight percent (8%) of all primary tumors in adults are Schwannomas. 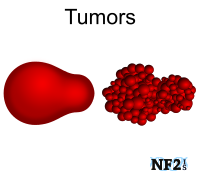 Most of those are related to NF2 and to Acoustic tumors. It's not as if we see these a lot. But we do see them often enough, especially in large centers like OSU and down in the Florida hospital where I am spending most of my time nowadays. Hearing more about this later. Newton.p19. This is a brief introduction. 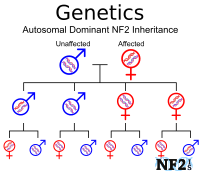 All of you know the basics of NF2, an Autosomal Dominant disease. Develop Bilateral Acoustic Schwannomas in this tumor type. Also, it can be a hereditary disease with a relative who has it, Neurofibroma, Glioma, Schwannoma, or Meningioma. Again, these combinations can give you NF2, along with the traditional bilateral phenotype. Usually, occurs between the second and third decades in most people. 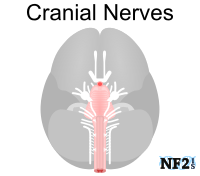 With NF2, you are more susceptible to other tumor types; Cranial and Spinal Meningiomas, Ependymomas, and Gliomas as well. Newton.p20. Presenting symptoms: Unilateral or Bilateral Hearing Loss, Tinnitus, Vertigo (imbalance issues), Cerebellar Dysfunction, Trigeminal Nerve Dysfunction with facial numbness, Facial Paralysis, or Dysphagia (difficulty with swallowing or headache). It can be any combination of all of these depending where the tumors are growing and how large they are. Again, these didn't turn out well on this computer. Newton.p21. This is an MRI showing an acoustic tumor on the right. This is a specimen showing a huge one down here growing and splicing the brain stem in here. You can see how large this one was. This is another one showing a slide of tumor tissue on an NF2 patient with bilateral very large tumor pressing on the brain stem. Newton.p22. This is supposed to be purple-looking tissue with lots of bundles of tumor cells, very dense. That's what a typical Schwannoma looks like under the microscope. Newton.p23. Here is another very large tumor with severe Brainstem Compression. Again, you see on this one, the loss of hearing related to a tumor like that. I think Dr. Chang will talk to you more about this. This is a brief introduction to the molecular biology of this tumor. 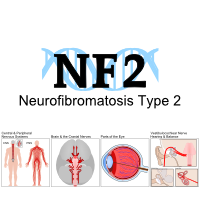 The NF2 gene is linked to Chromosome 22q. It is a disease involved with the loss of a tumor suppressor gene, MERLIN, which is right there in this diagram. Newton.p24. MERLIN is involved in Plasma Membrane and Cytoskeletal Networks in control of movement of cells; and the function of it changes cell adhesion and proliferation and makes cells more proliferative, mobile and active. When the cell is in its normal working state and binding, some of these adhesion molecules, the tumor cells and proliferation is turned off. When the cell is not bound, in this case, it's not bound because it's damaged or not produced properly in an NF2 cell, you end up having activation of adhesion molecules and have proliferation. That leads to Transformation of the cell to a tumor cell. Newton.p25. There are lots of ways to get mutations in this gene and the protein is reduced and the content inside the cell. Then we get to the Avastin™ NF2 story. Why did they even think about using this in this tumor type? It ends up being a similar story to a glioblastoma. These are vascular tumors. They light up densely on MRI scans. They found out that they have a lot of expression of VEGF, 100 percent of the tumors will express VEGF. Many of them will express the same receptor, the VEGF, R2 receptor. People thought this is a tumor that maybe will respond to this drug, let's try it and see what happens. Newton.p26. So Dr. Plotkin at Harvard published a study back in 2009 where NF2 patients who could not go through more surgery, had large tumors that had grown through radiation and put them on Avastin™, on a mild dose. And in his small group, he saw tumor shrinkage in nine of ten (9 of 10) patients. Most of those were minor shrinkage, but still, he was amazed that so many of them responded. The result was reduction in basically one quarter. We weren't having huge responses, but they were shrinking often by twenty to twenty-five percent (20% - 25%) or so. Newton.p27. In this tumor type, this is something we had never seen before using chemotherapy. Then also a set of people had improvement in their word recognition hearing ability. They tolerated it pretty well. Pretty much no toxicity worse than Grade 1 or 2, most having fatigue and kidney issues. So then once he published that first initial data, other people around the world started looking into this as well and started developing more data. Newton.p28. A German group talked about two patients back in 2010 that responded on the same dosing with tumor shrinkage in over 40 percent. They described very good responses. They both actual -- one of them had improved hearing for over six months. Newton.p29. 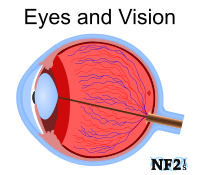 Dr. Wong in 2010, developed an animal model of NF2 and was treating them with anti-VEGF therapies. He used Avastin™ and another drug called Vandetanib (Caprelsa™) and found the tumors reduced with both drugs. After two weeks of treatment, they had tumor shrinkage with necrosis and apoptosis in tumor cells inside of the shrinking tumors. Growth rate was reduced on average fifty percent (50%), and survival of the mice was extended by over fifty percent (50%). In this animal model, this was helpful therapy and worked well to control tumor growth. Newton.p30. Dr. Mautier found that he needed to use fairly long term treatment with this drug to keep the tumors shrunk and keep them inhibited. So he recommended long-term therapy of a year or more if possible to get the best results. And then in 2012, Dr. Plotkin gave an updated series of his patients. He was up to 31 patients at that time; all had progressive acoustic Schwannomas that couldn't undergo more radiation. He had improved hearing in over half. So thirteen of twenty-three (13 of 23) evaluated patients had improved hearing. He had radiographic responses with over twenty percent (20%) reduction in size in 17 of 31. And response developed within three months in over half the patients. So a pretty rapid response. And then ninty percent (90%) of them had improved hearing after one year of therapy. And almost 90 percent had stable or decreased size of the tumor. Pretty good responses, pretty good results compared to what people did in the past with chemotherapy. Newton.p31. So then there was a French group; Hochart described seven (7) patients they treated, had similar kind of results. One major response with over fifty percent (50%) reduction. Two minor responses with over twenty-five percent (25%) percent reduction. They looked at the annual growth rates of tumors after a year of therapy. It reduced from one hundred and thirty-eight percent (138%) percent down to thirty-six) percent (36%). One person had some improved hearing. Newton.p32. The last one is from an ENF group in Europe, published just last year. 12 consecutive patients and in 7 of 18 tumors, they had reduction in size by MRI. And the responses were sustained in six tumors over two (2) months. Three patients had objective improvement in their hearing. Newton.p33. Then we get back to my experience at OSU. Two patients that I treated with this, they are both in the room right here, Steve. Both of them I used long-term treatment similar to what the German doctor described, 12 cycles over a year, giving the full dose. The other patient was treated in Kentucky for her tumors but controlling her therapy through OSU. It was well tolerated in all three people. And the tumors remained very stable. One of the patients had minor shrinkage with slight expansion of the brainstem. And after the year of treatment, the tumors remain stable by MRI after we stopped therapy. Newton.p34. So this is patient TN, 41-year-old guy at the time. Kind of goes through all his various treatments. Had gamma knife, a couple of operations, eventually was at a point where the tumors were slowly growing and causing severe compression of the brainstem and felt we should try this to maintain tumor stability or try to do that and not allow further damage to the brainstem. He ended up going through 12 cycles of Avastin™ and since then has been on a break from treatment with tumors being stable. Again, this is not showing up great, but this was his MRI scan before he started the Avastin™. Newton.p35. You can see how dim the brain stem is here, being crushed by the tumors. On this one, this tumor is a bit smaller. The brainstem has widened and gotten a bit larger from less compression. So, again, he had a minor response there with a little bit of tumor shrinkage, a little bit of expansion of the brainstem in between the two tumors. And that was stabilized after a year of therapy and has been maintained since then, off treatment. Newton.p36. So my last slide, Avastin™ does appear to be active against NF2 tumors in those Schwannomas. We see frequent stabilization, occasional shrinkage. Long-term therapy is needed. You can't just treat these for a couple of months. For the best result, we have to treat them a year or longer. It's well tolerated in most patients. Newton.p37. What dose is best? Five milligrams (5mg) or ten (10mg)? Actually, we don't know. In the initial Plotkin study, 5 milligrams were pretty effective. A lot of people used more aggressive dosing, which is the dose we use in the high-grade glioma patients. No one knows which dose is the best. I doubt a trial will be done. Newton.p38. Then we have -- this is not FDA approved for use in NF2. It's approved for glioblastoma. It's difficult to get insurance to cover the usage of the drug for NF2. Multicenter clinical trials will likely be needed to get FDA approval. Will that be done? I'm not sure. I'm skeptical that we will be able to get that done. That would be helpful, to finally get FDA approval and get insurance companies to use this on a consistent basis. Newton.p39. I think that's my last slide. Thank you for your attention this morning. I'd like to answer some Questions. Thank you. Question: You were speaking of using Avastin™ for Schwannomas only, not meningiomas? Dr. Newton: It's being used sometimes for large enhanced refractory of meningiomas. There are some people who published studies on it. It hasn't been as consistently helpful as it has been in Schwannomas so far. It's not as good as it is in high-grade gliomas. I used it a couple of times myself with really large, nasty meningiomas. My results have been kind of mixed. A few people have responded and stabilized, and some people grew right through it. I think right now it's less consistent responses. Question: I have another Question. You said that low-level oxygen and inflammatory enzymes excite -- are you saying VEGF? Question: Tumor growth. Does an oxygen therapy like increasing oxygen to your brain and the use of anti-inflammatories help to inhibit - - or is that out of your field, you know, of study? Dr. Newton: Some people are trying to use hyperbaric oxygen as a sensitizer as a way to increase the oxygen content inside tumor cells. Most of the time doing that in combination with chemotherapy or radiation therapy. But those studies have been hard to do because of the logistics of having somebody inside of the hyperbaric chamber at the same time trying other things with them. So there haven't been too many well controlled high-quality studies. It seems to be something where on paper, the science behind it makes sense. It seems to be hard to clinically do it in a hospital setting. It's hard to pull that off and make it work. It's hard to make it practical. It's a very complicated thing to do. Dr. Newton: Your idea is on the right track. Steve: We have time for one more Question. Question: My concern with this medication has always been the Neovascularization. It can't be understated how important that is in other areas of our body and cardiac and Ophthalmic. Can you speak to that? Dr. Newton: I know what you are getting at that. It is a concern. It has been thousands of patients who have been on this drug. There are issues with wound healing. Again, you need to have new vascularization to heal tissue after surgery and other trauma. Avastin™ does impair wound healing. That kind of thing is a problem. In terms of regular day-to-day bodily functions with vascularity does not seem to inhibit those enough to make it a major problem. Now, there is a risk of bleeding with this drug. It does increase the risk of hemorrhage in the brain as well as other areas in the body. That's a low risk for 1 to 2 percent. Those are minor low-level hemorrhages. I have had a few people on my own bleed on us. Two of those were minor. One was pretty serious. One had to have therapy stopped forever because of it. But, again, usually, for typical day-to-day vascular functions of the body, it does not seem to be a problem. Question: I was talking more about the importance of developing additional cardiac blood supply to prevent a heart attack and how your eyes constantly need more oxygen. Like long term things. Dr. Newton: As far as I know, that isn't a major issue. Question: Maybe we don't know yet? Dr. Newton: Well, we may not. Again, I have not seen anything published along those lines to suggest it's a big problem. I think that's all I can do. Thank you for your attention. Phyllis: Could everybody please start sitting down. Good morning! Everyone get a seat and we will get started. We have Dr. Dunka. Phyllis: I wrote out my little introduction because I am really, really bad at being spontaneous. I have a short speech to get through. This says Dr. Oliver Dunka and Dr. Michael Harris are joining us from the Wexner Medical Center at Ohio State and Nationwide Children's Hospital. Dr. Dunka is the director of the division of oncology and neuro and cranial surgery. He is also a professor in the Department of Otolaryngology. Dr. Harris is a fellow under Dr. Dunka completing his fellowship at Ohio State. This is according to the OSU website. If I am giving you incorrect information, they can let you know. After he finishes his fellowship at OSU, he will be joining the medical faculty at the University of Wisconsin. This morning, they will share with us the mystery of an acoustic tumor removal. And Dr. Dunka will also be giving a brief update on the auditory brainstem implant, ABI. Here they are. Dr. Dunka: Good morning, everyone. Thanks again for having us every year here. Some of you guys were here last year when we talked about the brain stem implant and any updates we had. There are some updates. Specifically, pertaining to the MED-EL implant. As you know, there is only one brain stem implant that is FDA approved. But Dr. Dunka is moving probably towards having the second implant approved anytime in the future. Dunka.p5. 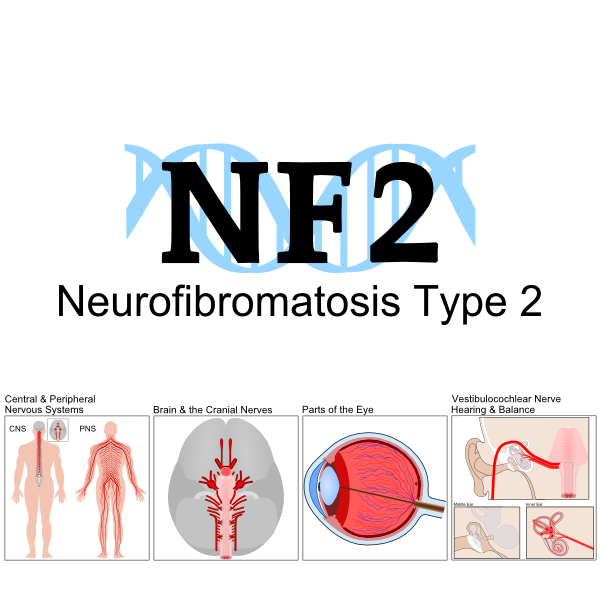 So really briefly, we all know, and you heard it from Dr. Newton what NF2 is. I don't have to repeat that. We know that our goal in managing folks with NF2 is really, of course, to take care of the tumors, but really to preserve hearing as long as we can. So our goal really, every time you come in to see one of us, we'd like to have that information on hearing available. So we like to have a hearing test, a recent hearing test available. So we can put that information in line with the information we have from the MRI's on where the tumors grow, and make a decision on what to do. Dunka.p6. But hearing is absolutely critical in people with NF2 because we try to preserve hearing as long as possible. And again, the brain stem implant, as depicted here in the image, the Cochlear Implant is brought into the Cochlea here, obviously. But then the cochlear implant relies on having a functional nerve that -- the cochlear nerve, that's the acoustic nerve to transmit the information to the brain. Oftentimes the acoustic tumor removal, or the acoustic tumor itself, damages that nerve. Dunka.p7. So we have to put the brain stem implant basically here in this area. The area for a cochlear implant should be up here. For a brain stem implant, should be right here. We basically bypass the cochlear nerve and place the implant right here. Dunka.p8. Here is a nice picture of that depicting where we place the brainstem implant. Unfortunately, in the brainstem, the frequencies that are nicely aligned in the cochlea, so in the inner ear, the cochlea, every frequency has a place. And we use that principle with cochlear implants because each electrode can then stimulate a very specific frequency spectrum. 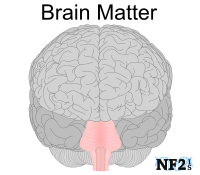 The nucleus in the brainstem, which we stimulate with the ABI has that as well, but it's to a much less degree. So when we do brainstem implants, and we activate electrodes, they are not as frequency specific as with a cochlear implant. And that's really what makes cochlear implants work and work so well, is that those frequencies are aligned along the inner ear. And unfortunately, the brain stem implant doesn't have that. Dunka.p9. As you all know, we place a magnet typically for cochlear implants. For brain stem implant, most commonly we don't. We take the magnet actually out of the implant and put a little placeholder in instead. So that allows you guys to have MRI's. As you know, we didn't leave the magnet in unless we are certain that person will not have an MRI in the future. Because MRI's are based on magnets, magnetic resonance imaging. And that's really what we do with the cochlear ABI, really. I am sparing you the history here. Dunka.p10. I wanted to show some pictures of the new device that has been approved in Europe. So the new device is from another company that is also a cochlear implant company. You know there are three companies out there: Advanced Bionics and they don't have a brain stem implant. Cochlear Corporation, which is the ABI currently FDA approved. And there is Med-El has an ABI, but they are a European company. To this point, they have not gone through the FDA approval process. The advantage of their ABI is that MED-EL, in their cochlear implant, they have a magnet that you don't have to remove with an MRI. You can just leave the magnet in. They have a patent that allows the magnet to spin in accordance with how the magnet on the MRI spins. So you get an artifact, but the implant doesn't move or heat up. It's a nice feature, and it's probably something we will be able to offer down the road. We can't offer the MED-EL ABI. We switched to the System 6. Dunka.p11. The cochlear ABI is a new device. There weren't enough devices, so they allowed us to bring the MED-EL ABI into the country and used it. I personally haven't used the Med-El ABI, but there is feedback from surgeons who like the electrode which is smaller than the cochlear electrodes. They like it somewhat better. This is it. It's a smaller paddle that goes in the cochlear nucleus that stimulates. It has fewer electrodes, but it's smaller. That seems to be at least equal to what we have seen with the cochlear ABI. And, again, the nice feature is that it is MRI-compatible. You can still take the magnet out if you don't want that artifact around the implant. But for most acoustic tumors, we could leave it just in, so you don't have the double-sided sticky tape on your receiver. It's a nice addition. Hopefully, we can offer that as an approved device down the road. Dunka.p12. Right now, we can offer it, but we have to ask the FDA for permission every time we do it. Which sounds like a big deal, but it really isn't. It's a letter and they have thirty (30) days to respond. So we have done that before last year when the cochlear ABI wasn't available. We had to do that on a few patients. Writing the government doesn't sound very simple, but it actually -- they have made that process pretty easy. Dunka.p13. There is also a feature that the MED-EL ABI has; it's placing an electrode. In the operating room, we place it on the cochlear nucleus and do recordings which can take an hour or two. We can see if we get good stimulation from that area. So we place an ABI, we have to make sure it's in a place where we get responses. Dunka.p14. We don't have to do that with cochlear implants. Cochlear implant, we just place it in the inner ear and close the patient back up. Brainstem implants, we have to place and then record. We basically -- we stimulate with that electrode, and then we record how much is getting the higher level functioning, the auditory centers in the brain. And that placing electrode allows us to just map out where we would have to place the ABI before opening the actual implant. If we get good response, we can then open up the implant and place that. We have to verify that, but we get a better idea anatomically where in the cochlear nucleus we are get good responses. That's a nice feature. Dunka.p15. Again, we are hoping we can bring that so you have the choice as to what you'd like us to implant. With cochlear implants, too, some of you might know that we let patients choose the device. If you select a cochlear implant, we send you home with information of each implant, what each implant's features are, and then let you choose whichever you like. Again, hope that choices will be an upgrade. We certainly think the MRI-compatibility is a nice feature. Nothing dramatically different in terms of how the implant works or how well it works. But I think more of the/quality of life kind of consideration. Phyllis: This may be unrelated to the ABI. I wanted you to mention Dr. Kim. She will be here tomorrow and will introduce herself in that talk. Since she is under your area, if you can briefly talk about her. Dr. Dunka: Dr. Leslie Kim. So we actually were very fortunate to recruit Leslie Kim. She is a facial plastic surgeon. Some of you guys have met Dr. Smith. Phyllis: She will be here tomorrow. Dr. Dunka: She will be here tomorrow. Did you say tomorrow, right? So we recruited her. She was an OSU grad and went to Johns Hopkins to get training on facial plastic surgery. 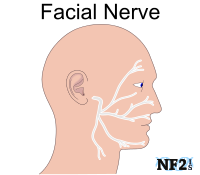 Her specialty is the facial nerve for folks who have permanent facial paralysis, palsy. She is very skilled and offers dynamic reanimation of the face, which is actually a new technique, which no one in Central Ohio has been offering in the past. So we are very fortunate to have her. She is a pleasant person. She is very nice, very skilled. And we are just thrilled to have her on board. Question: Regarding, the ABI, with what we currently have, the next generation will be able to give us more hearing than the current ABI does right now? Dr. Dunka: So there is certainly a lot of research in that area. Briefly, there were, in the early 2000s, there was a penetrating ABI. The idea behind that was to use the frequency allocation in the brainstem in a better way with penetrating electrodes. You basically have electrodes that you stuck into the brain, not lay an electrode on the brain. In theory, that should have worked better. But practically, it has not. So unfortunately, that has been abandoned. The other theory that hasn't really panned out is a midbrain implant. So between the cortex, between the part of the brain that processes the sound and the brain stem, there's also a station called the inferior COLLICULUS. That IC also has an area that arranges frequencies very anatomically. And there's a person in Italy who has done a few of those, but unfortunately, folks have not heard any better. I think our biggest effort is how do we improve placing the paddle, and how do we improve recording during these surgeries. That is absolutely critical. The better the placement, the better the implant will work. And for us, unfortunately, placing the implant is actually surgically not very hard, but we have to sit there and work with audiology. It can take up to two to three hours. If we are not happy with the placement, I think it's very important to move it. To measure again, move it, measure again, move it, measure again. The more often we do, the better recordings we have, the better responses we get, the better the implant will work. Unfortunately, we don't have a better implant. We are just learning more and more about those recordings and how to improve placement. Question: My wife has an ABI and she was experiencing so much noise that she quit using it. Tinnitus. Is there any -- the improved model, does it reduce that? She stopped using it because there was so much noise. Dr. Dunka: Tinnitus is very hard to treat. Unfortunately, the stuff that you see on TV and the magazines, unfortunately none of this really works. The reason none of it works is because tinnitus is something the brain generates. There is evidence that by providing sound that we can suppress that brain-generated noise. It works in some, but not in every person. Question: What does that mean? Exterior noise, like a fan or something? Dr. Dunka: Exterior. But for example, cochlear implants are well-known to suppress tinnitus by just providing sound. So the brain doesn't like complete silence. And it generates sound. Unfortunately, implants, cochlear or brain stem implants don't always work in suppressing that, you know. Question: She wears hers, and it gets worse. There's nothing that you can do about it? Dr. Dunka: That happens with brainstem implants, but not with cochlear implants. We can sometimes remap. We can find out which electrode is causing it, which electrode isn't causing it and map around it. It's worth to come in and try to do something about it. Question: That's with the old model she has. The new model does not help that any, the noise? Dr. Dunka: Probably the same thing. Question: Same thing, have to remap it. Dr. Dunka: There's always that option. Question: She had a doctor -- audiologist remapped it. Every time she did it, she got shocked. That discouraged her, too, from going back. You have had success without shocking people? Dr. Dunka: Yeah, I think so! We don't like to shock people! Question: Every time she went to it, she got shocked. Dr. Dunka: I am not saying it doesn't happen ever. But if you identified electrodes that have what we call non-auditory stimulation, we like to shut those electrodes off. There is no benefit from shocking. If it's not hearing, then we shut the electrode off. That's why it's important -- in the operating room, you can't tell us because you are asleep. That's why it's so important to use those recordings. There are recordings, electro-physiologic recordings. We have electrodes on the outside, and we have to filter out from the overall brain activity what the auditory response would be. Question: The history of the other recordings, several of them? Dr. Dunka: In the operating room, we pick that placement with the best recordings. It's very, very critical, and it's very difficult for the audiologist to do those. We actually just hired someone to just do that. Question: She was talking about tinnitus. I have never had an issue. I have never had an issue. Why don't I have an issue where someone else would have a big issue? What causes that? Or what doesn't cause that? Dr. Dunka: It's a great Question. And I wish I had the answer. It's very, very hard to predict who has tinnitus. The answer is, is we don't know. There are several theories, but again, it's very hard to predict. Okay. I'm going to ask Dr. Harris to talk about his topic. So what happens when you guys, after you go to sleep, what happens in the operating room. I hope it's not too scary. Dr. Harris: Thank you very much. It's a real pleasure to be here. Thanks, Phyllis, for inviting us. I'd like to talk this morning about a very practical topic, which Phyllis suggested, what exactly happens during VS Surgery after you go to sleep? It's a good topic. Even though many of us have had surgery in the past, there may be Questions about what happens after you go to sleep. Also, maybe the intent is for this to be informative for family members as well who wonder about the process. As Dr. Dunka said, I am a fellow, which means I am in my last year of Neurology training, which is focused in dealing with Schwannomas. It's a pleasure to be here. Harris.p2. The beginning of the process, before it's time to go off to sleep, really begins the morning of. As many of you know well, that begins with waking up potentially earlier than usual, skipping breakfast and making your way to the hospital, which this itself can be an ordeal, parking and making your way there. On occasion, we will have you come into the hospital the night before, especially if you are traveling a great distance ahead of time so we can get started first thing in the morning. Soon after finding your way to where you are going, you check in in many variety of preoperative areas. Harris.p3. Some of the pictures I have here are from different areas at Ohio State and the Eye and Ear Institute. The general way this works is you check in. They will have you change out of your street clothes into the gown that you will be wearing into the operating room. At this point, this is where the process begins being asked many Questions, often the same Questions over and over again. Which is the real theme of this process. It's part of the system of checks that we have, to make sure that everything is in order and that we're doing the surgery we want to do, on the right person, and so on. Harris.p4. So, you'll be taken to your pre-op room. Again, you meet a lot of people here: pre-op nurse, get your IV started, sometimes in the operating room, but usually at this point. The surgical team will stop by and usually make a mark, sometimes initials, sometimes just an X, especially in cases where there are two potential sides to the surgical site. They will review the surgical plan with the team and sign a formed consent. You will meet the anesthesia team. This is another opportunity for your family members to ask Questions about what's going to happen that day and what to expect after surgery. Harris.p5. And eventually you will be transported from there, usually on a bed, to an operating room. The first thing you will notice, it's usually pretty chilly in there. You will be transferred from the bed that you came up on to a much narrower bed with lots of equipment. And usually additional people that you haven't met yet to that point. You'll notice the bed you move on to is much narrower. We will place your head on an unusual pillow. People will start moving around you, setting things up and readying all the equipment for the surgery. Harris.p6. As you lay there, you notice there are overhead lights that usually remain off until you're asleep. Those assist with surgery. As many of you will remember, we have squeezers placed on your legs which help prevent clot formation since you will be immobile during the surgery. And some people you will meet, in addition to your surgeon and trainees the surgeon has. Harris.p7. No matter where you go, there is usually a surgical tech or scrub nurse in the room. Their job is to assist the surgeon with equipment, instruments. As you can imagine, surgery involves a lot of equipment and instruments. It's their job to anticipate at times the instruments that are needed and to make sure they are in good working order and hand them over. Some examples, we use high-speed surgical drills to remove bone, to access the area where the tumors are located. We use something called the suction irrigator to help suction away bone, sometimes tumors. At the same time, provide irrigation, flushing and clean out the area to see what we are doing. A variety of soft tissue dissectors, and electrocautery for preventing bleeding and to aid with the suction as well. Harris.p8. Anesthesia team, it's their job to get you safely off to sleep and help secure your airway and manage the medications given by your IV and by your breathing tube during the case. They monitor your vital signs, temperature. They usually -- in the case of Schwannoma surgery, they will be at the foot of bed and the surgical team will be at the other end. So once you are asleep, this is generally the layout. Harris.p9. So, again, there's a scrub tech or nurse who helps with equipment and instruments. the surgical team, working under a microscope. In this picture in the background, there is another person that really no matter where you go for surgery, there is somebody called a circulator. It's their job to circulate around the room and sometimes leave the room to get additional equipment if anything is needed. They are not in the sterile field. They can get additional things that we need that are kept in the hallway or nearby. Harris.p10. So getting to what happens when you go to sleep, just before you go to sleep. Your surgical team will do one final check of your operative imaging and audiometry, hearing test. Again to verify that we are working on the right side and that we are taking the right approach. Harris.p11. This varies a little bit depending on your institution, depending on where you are in the country. But there is usually a system of safety checklists. At Ohio State, the way we do this, before induction, there is an anesthesia sign-in. While you are awake, everyone introduces themselves, their name and role, introduce themselves to you and each other, even though they work together for many years. We will again review your consent, confirm things like allergies and make sure all the necessary equipment is in good working order. Harris.p12. Then at this point, the process of going off to sleep begins. For adults, this generally is done using medication that's administered through the IV. It's usually started in the pre-op area. You're also getting through your IV, antibiotics that we administer during the case. Sedation and anesthesia, steroids which help prevent swelling of nerves, and something called a diuretic, a medication that promotes urination. That's actually given to help relax brain function. It gives us more room to work. So finally, induction of anesthesia. Harris.p13. This is when the countdown begins. You drift off to sleep, and then it's important to secure your airway to make sure that we have a safe, controlled airway while you're asleep. This is done using an endotracheal breathing tube. It goes into your windpipe using a number of methods. The anesthesiologist will watch the tube go in the right place. At the end of the tube there is a balloon cuff that helps prevent the breaths delivered from coming back up or the anesthetic gas escaping. Finally, it's secured in place with tape so it doesn't move. Harris.p14. This is a Question that comes up all the time: what happens if you have to go to the bathroom during the case, which is a good Question. Especially if surgery is longer than two or three hours. We will routinely place what's called a Foley catheter that goes into the bladder, similar to the endotracheal tube. This has a balloon cuff at the end. This is also useful for monitoring your urine output because we give you medications to make you urinate to relax them. Harris.p15. We use something called a bear hugger to keep you warm. This is like a blanket that has plastic channels in it, and warm air is blown into the channels. Your temperature is monitored throughout the case. As we said the operating room, as many of you will remember, is often chilly. And this is one of the methods that we can use to keep you warm. There is a temperature probe sometimes in your nose or sometimes in a urinary catheter. We can make adjustments this way to your temperature. Harris.p16. A very important tool that we use is something called nerve integrity monitor. This is an additional, an adjunctive tool that we use. Once you are asleep, we put a probe, electrode next to your mouth, next to your eye. If we are near the nerve, the nerve is under any stress; this will make an audible alert to us, let us know that. We can also hook this up to a very delicate probe that we will use to probe different tissues to make sure we are safely away from certain nerves. Harris.p17. So, we will also, before the surgery begins, we will inject something called local anesthetic that has a numbing property. But also, very importantly, it helps prevent bleeding. It has an agent in it that restricts the blood vessels. We give you some of that right over the surgical site, wherever we make our incision. Harris.p18. After all of that, you are asleep, and breathing is secure, and equipment is checked. Then we get you surgically prepared using surgical soap, often something called Betadine is used. And oftentimes we will shave hair in the area of the incision to give us room and to get the hair safely out of the way. We make final preparations to our equipment, including microscopes, operating microscopes. Just like we prepped you, just like we wear gowns, we put a sterile cover on the microscope. Then we prep ourselves, wash our hands and arms. Then switch into our sterile surgical attire, and it gets underway. Harris.p19. There is a surgical tech, scrub, and anesthesiologist and team all ready to go. At this point, finally, now we begin surgery and make the surgical incision. This will take any number of shapes, depending on the approach that we all decided on ahead of time. This is what we would have talked about in clinic and on the morning of surgery. So we make our incision. The point of this is to get down to the bone because we need to do our craniotomy, remove the bone to access the tumor. This takes a number of shapes, depending on the location, the size of the tumor and other factors that we would have talked about and decided collectively with you ahead of time. Harris.p20. So, removing the bone. We do this generally using high powered surgical drills that are a lot like instruments that the dentists use, with rotating burrs. Sometimes what we call cutters, and others called Diamond Burrs is, which are covered in diamond dust, actually to remove the bone. Neurosurgeons sometimes use, for their craniotomies, use a little bit different-appearing saws and drills. But the general principle is to move from one important landmark to the next, keeping you safe as we go. And eventually getting to the tumor itself. Harris.p21. So as I said, this is microsurgery. The surgical team uses microscopes. The rest of the team usually has access to what we are doing by screens in the room, sometimes one or many around the room. Here is showing a set-up so that the surgical nurse can see what's happening in the surgical field and anticipate what the surgeon needs. Sometimes we also in addition to microscope will use Endoscopes to give us additional visualization. We need to see in a tight spot that's hard to see with a microscope. Harris.p22. So, for a Schwannoma surgery, which is known well, the goal whenever possible is to meticulously separate the tumor from the important nerves that so many are involved with. Using all the tools we have available, the goal is to identify and preserve the hearing nerve and facial nerve when possible. This is achieved by direct visualization and also the nerve stimulator. Harris.p23. So how exactly do we take the tumor out? This is a really interesting topic because there is a lot of variability in the tumor consistency. Oftentimes that's not something that we are able to predict until we are actually there face-to-face with the tumor. Some tumors are so soft that they can be removed just by using a suction almost. Others are almost rock hard. Harris.p24. So, the tools that we need to use, we have them all available. We don't know sometimes -- sometimes we have hints from imaging ahead of time, but not always. So, it's usually a combination of gentle peeling, cutting certain area, suctioning. Or using an instrument that delivers ultrasonic vibrations to break up the tumor and suction it away. And so, either in one big piece if possible, sometimes in several pieces, sometimes in very little pieces, the tumor makes its way out. Harris.p25. We send off a portion of it -- we send it to Pathology. Some of this is sometimes sent for frozen section, which is a technique that the pathologist can use to give us an impression within 30 minutes to an hour, somewhere in that window they can give us a cursory impression. We do this if we are not sure if we have a Question about what it is, is it a meningioma versus a Schwannoma. Harris.p26. In other cases, if the diagnosis is not so much in Question, we will just send it to something called permanent section which is a much more painstaking process. They look at every single little piece and slide. It takes some time -- it varies -- about a week for them to do that, to get the final diagnosis. And whenever possible, we use additional tissue that's available for research purposes, such as I think work Dr. Chang has done at Ohio State. They will use that tissue to help discover treatments for this. Harris.p27. As you can imagine after removing the tumor, there is a space that's left. And it's also a risk factor for leakage of the fluid that's in the brain sack. Harris.p28. So, for those reasons, we will often borrow some belly fat, and we will get a hunk of it, depending on the size, golf ball size, sometimes a little bit more or less. We take that and essentially fill the space that the void that was created. And sometimes sort of dumbbell so that some of it is inside the brain sack and some is outside. Harris.p29. Then we begin the process of closing things up from the inside out in layers. At times, we use very thin titanium mesh plates to help hold that fat in, which doesn't set of metal detectors, can't feel it. And during this process, when we are close to it being done, closing you up, we will start the process of doing equipment counts. Again, another safety check that we do, pretty much everyone in the country does this routine. Although it may take different forms. But make sure we have everything that couldn't be left behind. Which never happens, but we like to do this every single time. So, we do our count, and once the count is correct, we finish up -- we close the surgery. Harris.p30. Finally, the anesthesiologist scales back their sedating medications. Once you demonstrated to them that you're sufficiently awake and able to protect your airway, they remove the Endotracheal Tube. Somewhere in there before you are fully awake, we will put on a fresh dressing. This looks different depending on who your surgical team is. Generally, it's a big white head wrap that stays on for two nights. That serves the purpose of putting pressure on the surgical site and keeping it from getting bothered for a couple days after surgery. Harris.p31. Your memory may come back to you somewhere in the recovery room or in the surgical unit where we have taken you afterward. Post anesthesia is one example. It looks like a recovery room. The nurses are here and take care of you. This is where you go to make your way to the intensive care unit. You are usually feeling foggy at this point. Harris.p32. Our first stop after delivering you to the recovery room is meeting with your family. While you have been asleep, they have been awake. They have been thinking about you and worrying about you. Over the course of the surgery, they get updates. At Ohio State, something like every hour and a half, two hours, somebody gives you an update. For the first couple of hours, there is really not much to update because it's a lot of setting up and positioning you. Phyllis: I have a Question. What do you do to the extent possible to see all the tumor has been removed? From one cell there can be a regrowth. Is there anything that you can do to see if you have gotten all the tumor out. Do you put it under a microscope just to see what happens, if you feel you have gotten all the tumor? Dr. Harris: Right. So, Phyllis is asking, what do we do to make sure we get all the tumor out. That's a good Question. Whenever possible, we like to get all the tumor out. And the whole surgery is microsurgery. So, we are using the best visualization that we can. But the most common situation where a tumor might be left behind is if it looks like it's unsafe to take additional tumor out that might put some of the critical nerves at unnecessary risk. Usually tumors, something we know -- I guess another part of that answer is, is we irrigate things out very thoroughly to make sure there are no cells left behind. If we are going for a complete total resection, that's a step that we take. That's a good Question. Any others? Question: You said the tumor gets sent to pathology to see if it's a Meningioma or Schwannoma. So, they are not arising from the same place. So, you are meaning like Meningioma, arose from different tissue that's growing to the hearing nerve? Dr. Harris: That could be. So, everything goes to pathology to secure the diagnosis. Both of those tumor types have certain characteristics that the pathologist can identify under a microscope things that we can't identify. Question: I thought they were all Vestibular Schwannomas. I didn't know there was a chance it could be a Meningioma. Dr. Harris: Rarely we will have a surprise. Question: About the titanium plate and the mesh. When you take a piece of the skull out, you are able to place it back, right? We all have a friend here that's having problems years later with this mesh and this titanium. So how many would you say, how often do you put that on? Is it depending on the approach of the surgery? Dr. Harris: It does, it depends on the approach. There are three common approaches that we use in general. Probably two of those are most commonly used in the cases for some approach where there isn't a bone flap to put back on. Dr. Harris: So pictures I showed were those cases we put fat in there, and titanium mesh is used to help hold it in and then muscle goes over that. In other cases, there is actually a bone flap that goes in. And then we use a little tiny sort of double Y-shaped, very small brackets to hold that in. It doesn't happen often that there is a problem with that, with the mesh or the plates. But it does happen. It's rare. Question: We have a friend that would have been here today if not. Dr. Harris: Is that right? We use it if it's necessary. Question: If the tumor is attached to the skull, you put the skull back on still? Or is it always the case you use a plate? Dr. Harris: Yeah, we wouldn't -- if the tumor was attached, if it was a Meningioma, if it was adhering to the skull, we probably would not put it back. Question: The plate you said? Question: I just want to say my Meningioma invaded my skull. They put my plate on. You could still feel my mesh plate. You could feel the little bolts. The bone is not there. And that was done back in 2000. I haven't had a problem with my plate. Question: No, no problem. Some people are afraid of shunts. I have had no problem with that either. I feel bad with what he is going through. Question: Well, having the top of the skull taken off to remove the Meningioma, how does that -- I am curious, how does that go back on? Do they normally just put it back on and screw it? Dr. Harris: The skull goes back on. Question: How does the top -- you are not using super glue? Dr. Harris: No. Generally, it fits back pretty well. Sometimes we have to widen the edges a little bit. Sometimes there is a little bit of a gap. That gap is spanned with those little brackets that I described using very small titanium screws about 3 or 4 millimeters long. Question: The bracket goes across putting through from one side to the other. Dr. Harris: For the situation, he is describing, yes. Dr. Harris: Thanks for having us.